The destroyer Cassin Young, now a museum ship run by the National Park Service at Charlestown Navy Yard in Boston, got hit by kamikaze aircraft in April and July 1945. J. Scott Harmon, who served aboard several destroyer types after his graduation from the Naval Academy in 1964, wrote this pictorial history while working as a Staff Curator with the National Park Service. This short ship history includes numerous historical photos from the National Archives and the National Park Service. 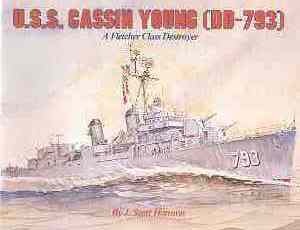 This ship history starts with a biography of Commander Cassin Young after whom the destroyer is named. Young distinguished himself in battle at Pearl Harbor, and he died in November 1942 during the Naval Battle of Guadalcanal when a Japanese battleship shell hit the heavy cruiser San Francisco, which he commanded. The book's next section describes the functions of destroyers in general and Fletcher class destroyers of which the US Navy built 175 from 1942 to 1944. The following two sections summarize Cassin Young's operational history during World War II from its commissioning in December 1943 and during the 1950s until its decommissioning in April 1960. The author used Boston National Historical Park's transcriptions of interviews with former crew members, and he met three WWII crewmembers when visiting Cassin Young in Boston. However, the book contains almost no personal accounts but rather mostly consists of a straightforward summary of the ship's history from official records. The book U.S.S. Cassin Young (DD-793) covers the destroyer's kamikaze-related history in quite a bit of detail. Cassin Young fired upon three enemy planes and downed one on April 6, 1945 . Later on the same date, Cassin Young went to the aid of the destroyer Bush (DD-529), sunk by suicide planes, and the destroyer Colhoun (DD-801), also hit by several kamikaze aircraft. At 2355, orders came for Cassin Young to fire upon Colhoun and sink her since the ship had uncontrolled flooding and fires. On April 12, 1945, the book states that Cassin Young, the destroyer Purdy, and four LCSs at Radar Picket Station 1 together shot down several attacking planes, but one aircraft succeeded in hitting Cassin Young's foremast. The plane's bomb exploded above the ship and showered the decks with shrapnel and debris, killing one crewman and wounding 59 others. Repairs at Ulithi took three weeks, and Cassin Young did not get back to Okinawa until June 1, 1945. On a bright moonlit night in the early hours of July 29, 1945, a kamikaze plane hit and sank the destroyer Callaghan (DD-792) at Radar Picket Station 9A, 60 miles southwest of Okinawa's Point Bolo. Cassin Young fought off other incoming planes while the destroyer Pritchett went to Callaghan to take off survivors before the ship sank. On the next day during the darkness of the early morning hours of July 30, 1945, a "very slow plane" hit Cassin Young when stationed off the entrance to Buckner Bay. The crash killed 22 and wounded 45 . The book does not mention specifically the types of planes that hit Cassin Young and Callaghan, but the plane that hit Cassin Young is described as follows (p. 32): "The plane that hit the ship was an obsolete canvas and wood biplane that crashed into the ship at a relative speed of 62 knots." The book describes a plane that approached after Callaghan had been hit (p. 30), "Ten minutes later an old 70-knot biplane approached from Cassin Young's port quarter, passed overhead, and crashed 30 yards off the starboard beam." The book does not describe the plane that hit Callaghan, but Foster (2002, 302) gives the following description, "As it drew close, personnel topside were astonished to see that it was a biplane with floats. It was flying an extremely slow 85 miles an hour." Warner and Warner (1982, 267) have a slightly different description of this plane with no mention of the floats, "This was no Zeke, or Val, but the oldest of fabric-covered biplanes, with fixed undercarriage and traveling at about eighty-five miles an hour. The 250-pound bomb she carried must have taxed all her resources." Japanese sources (Hara 2004, 240; Niwatsukino 2006, 103; Tokkotai Senbotsusha 1990, 216) indicate that the only kamikaze squadron that flew on July 29 and 30, 1945, was the 3rd Ryuko  Squadron from Miyakojima, located about halfway between Taiwan and the main island of Okinawa. This squadron flew Type 93 Land-based Intermediate Trainers (Allied code name of Willow) with five men taking off on July 29 and two pilots taking off toward Okinawa on July 30. The sources quoted above describing the American views of the attacks on Cassin Young and Callaghan are generally consistent with the Japanese sources, since the Type 93 Land-based Intermediate Trainer was a biplane that flew at cruising speed of 75 knots (86 miles per hour) (Francillon 1979, 448). There was also a version of the Type 93 Intermediate Trainer that had floats, but Japanese sources indicate the planes that took off on July 29 and 30, 1945, were land-based. Also, the Japanese Navy had no seaplane bases on or around Miyakojima. The USS Constitution Museum Store, next to USS Cassin Young at Charlestown Navy Yard, sells this pictorial history of Cassin Young. The book makes a nice memento for a visitor to the museum ship. 1. The Cassin Young brochure published by the National Park Service indicates that the destroyer shot down three enemy planes. 2. 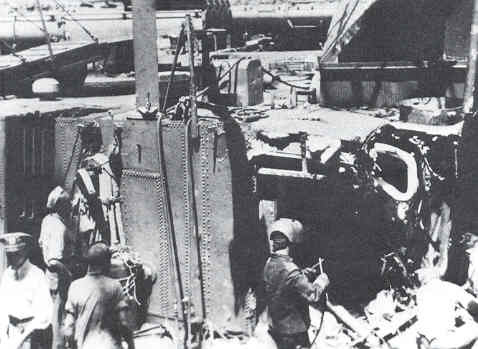 Page 32 of the book states that the kamikaze attack resulted in 21 dead or missing and 47 wounded. However, other sources (e.g., Stern 2010, 316; Cassin Young web page published by National Park Service) indicate 22 dead and 45 wounded. 3. Ryuko means "dragon and tiger" in Japanese. Foster, Barry J. 2002. The Last Destroyer: The Story of the USS Callaghan. Haverford, PA: Infinity Publishing. Francillon, René J. 1979. Japanese Aircraft of the Pacific War. Annapolis: Naval Institute Press. Hara, Katsuhiro. 2004. Shinsou kamikaze tokkou: Hisshi hitchuu no 300 nichi (Kamikaze special attack facts: 300 days of certain-death, sure-hit attacks). Tokyo: KK Bestsellers. Niwatsukino, Hideki. 2006. Nakoyokka hittobe (Rather than cry, I'll dare to fly). Privately published. Stern, Robert C. 2010. Fire From the Sky: Surviving the Kamikaze Threat. Annapolis: Naval Institute Press.